Por favor, tenga en cuenta que la disponibilidad del producto varía según la región. Sírvase contactar con el servicio de ventas de Olympus para obtener más información. Ideal for honeycomb composite skin-to-core disbonds. Works well to detect disbonds in crushed core conditions. 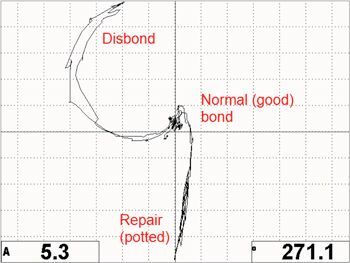 Allows for easy identification of repaired (potted) areas over disbonds. Available in a variety of probe castings. Detection capability: Detects defects in graphite-composite skin bonded to Nomex honeycomb; 2-ply through 7-ply skin thickness. Defects sized 25.4 mm by 50.8 mm; 2-ply through 18-ply. Defect size of 12.7 mm (0.5 in.) or larger. Suitable for detecting skin-to-core disbonds, crushed core, and other typical skin-to-core bondline defects. Suitable for continuous or mechanical scanning by using spring loading or constant pressure on the probe tip. Detection capability: Detects on metal to metal defects up to 2 mm (0.08 in.) thickness in the bondline, 6.35 mm (0.25 in.) defect size or larger; and on Fiberglass bonded to a foam core, defect size of 12.7 mm (0.5 in.) or larger, and a maximum skin thickness of 6.35 mm (0.25 in.). Detection capability: Internally spring-loaded three-position tension adjustments for greater consistency and accuracy. Especially well suited for overhead inspections. Features removable Delrin wear shoe. Designed for use with S-MP-03 and S-MP-4 probes. Ensures constant pressure is applied to the part. Also greatly enhances stability while keeping the probe perpendicular to the inspection surface. Incorporates a Teflon wear shoe and spring-loaded probe holder. Detection capability: Detects defects in graphite-composite skin bonded to honeycomb. Can be used on irregular or curved surfaces. Suitable for detecting skin-to-core disbonds, crushed core and other typical skin-to-core bondline defects. Used where access is limited. Works well on disbonds, crushed core and bond defects on the inside walls of composite structures. Bondmaster Cable - 11 Pin to 11 Pin cable used on Pitch-Catch and MIA probes, 11 foot (3.3 meters) length.